April Fool’s Day is almost here! Spice up a lesson plan, activity or project with humor. Humor is a great way to ease the anxiety of learning and can make learning difficult or stressful topics engaging and fun. Below are our some free web tools and apps your students will enjoy using to enhance their listening, speaking, reading and writing skills, while engaging with your topic or preparing for a test. For ideas on how to effectively use these tools for learning, check out my webinar recordings, Engage Learners with Humor and Teach English with Jokes, or my articles in the GO Teach magazine and The Education Horizons Journal, LOL! Teacher! Using Humor to Enhance Student Learning and Let’s Laugh! 10+ Resources for Inspiring Laughter. Enjoyed these ideas? Get your copy of Learning to Go and The 30 Goals for Teachers. Check out my infographic on Integrating Humor in the Classroom. Here is my webinar recording of Using Jokes for Learning and resources. Big Hug Labs has many different ways to create humorous photos and presentations. Create Memes with Meme Generator. I recommend this for adults and not students. Talking Tom and Ben News is an iOS, Android, and Amazon app where students act as newscasters. They report the news in pairs as either Tom, a talking cat, or Ben, a dog. Check out the other talking characters from Outfit 7 to get your students speaking English via funny characters. Quizizz is a web tool and app that works on any device to create fun games and quizzes. Teachers have the option of showing a meme after a question is answered. MouthOff is a free iOS and Android ($1) app where students choose a mouth, put the phone in front of their mouths, and talk to watch the mouth move. Bitstrips is an iOS, Android, and Kindle app for making fun comics with avatars that look like the students and their friends. Voki is a web tool for students to create animated talking characters. Blabberize is a website students can use to upload their drawings and images and draw a mouth to make the images talk. YakIt Kids and Chatterpix Kids are iOS apps students upload their images and drawing to and add a mouth to animate the images. Plotagon is a web tool and app that allows students to create animated avatar videos. SockPuppets is an iOS app for creating short movies with talking socks. Puppet Pals and Toontastic are iOS apps for creating short videos with fun characters that students animate. Tellagami is an iOS app for creating a talking adult avatar. 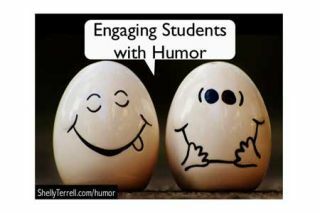 Challenge: Try one of these resources to integrate humor in your curriculum this year!